Adjustable Depth: Each support bracket can adjust from 20" to 32" deep to suit your particular installation requirements. Added Support: This easy to use bracket system adds strength and stability to any 2-post Telco rack. Whether anchoring two racks together or bracing them to a wall, the Kendall Howard Conversion Kit will provide a safer, more dependable solution. 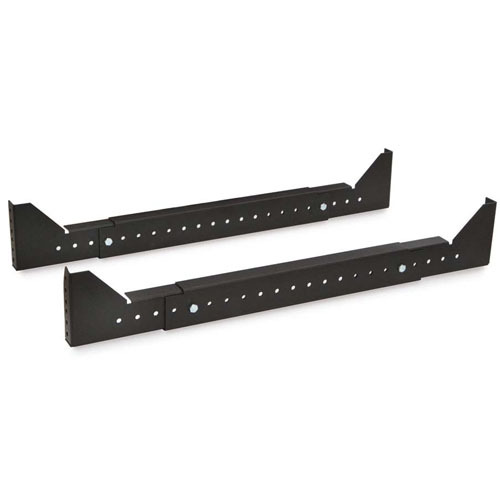 Great Cable Lacing Option: These horizontal brackets provide a great option for securing heavy and obtrusive trunk cabling up and out of the way. Only Uses 2U of Space: The support braces mount directly on to the vertical rack rails with standard rack hardware. Each brace requires only 2U of rack space leaving you plenty of room for your network, A/V, and other rackmount equipment. Depth: Adjustable 20" - 32"
Adjustable from 20" to 32"